The vehicle application is designed as a tool for drivers and field users. The user gets the task in real time as a to-do list and on the map base. 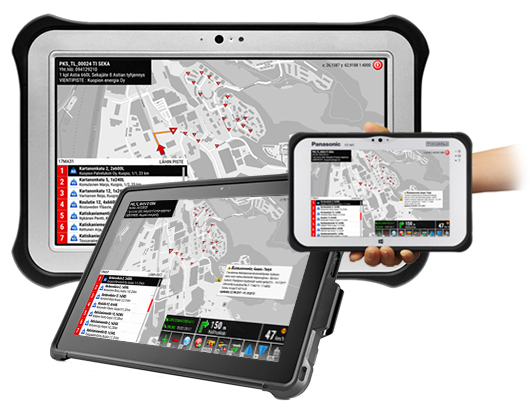 TCS Mobile Terminal enables you to streamline your workflow and assist staff on the ground. It is easy to record acknowledgments, weighs, breaks and deviations through an easy-to-use interface. On the vehicle terminal map, it is possible to mark, for example, walkways, maximum masses, altitudes, ditches, property limits etc. The user's work is facilitated by, among other things, the editable to-do list and favorite functions. 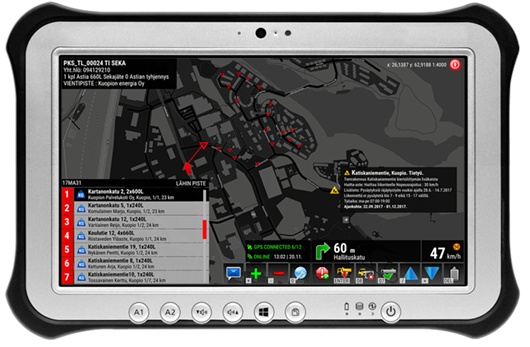 TCS Mobile Terminal will guide the route between the task points, so the driver can easily find unknown targets. TCS Mobile Terminal includes like all Ecomond products language support, ie the language is selected according to the user. The field user or driver can choose the terminal that best suits the situation. Alternative terminals include: smart phones, vehicle computers and tablets. The advantage is that the terminal is always included with a guard or installer, for example. The terminal also allows for RFID (Radio Frequency IDentification) and bar code reading.